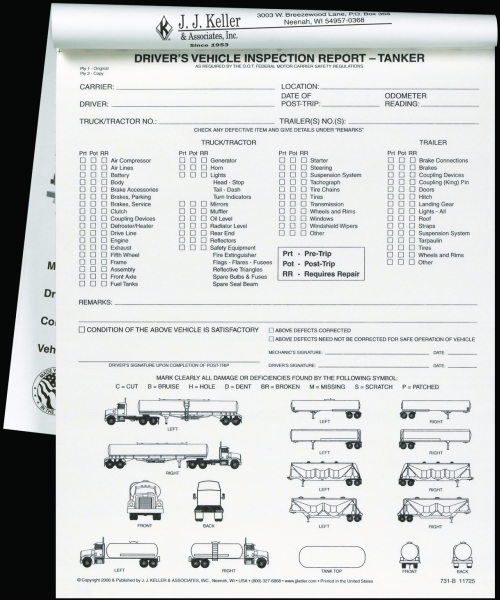 This Imprinted Detailed DVIR w Illustrations Vehicle Inspection Report for Tanker 2-Ply Carbonless Book Format 731-BD-C lists specific tanker vehicle parts to help simplify inspection - drivers simply check-off parts that need repair. The featured illustrations aid report accuracy and save driver's time, by helping drivers locate and identify areas of the vehicle with damage or deficiencies. This detailed DVIR satisfies DOT Vehicle Inspection regulations 396.11 and 396.13. 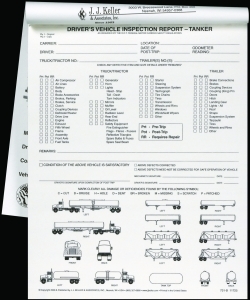 This book format detailed DVIR with illustrations for tanker vehicles include key regulations printed on inside front cover to remind drivers of DOT-required procedures.